Wild Dogs are also known as Hunting Dogs, or by the apt name, "Painted Hunting Dogs" - referring to their beautiful patchwork coat. These dogs are highly endangered, and the Okavango region is home to one of their most stable populations in Africa. 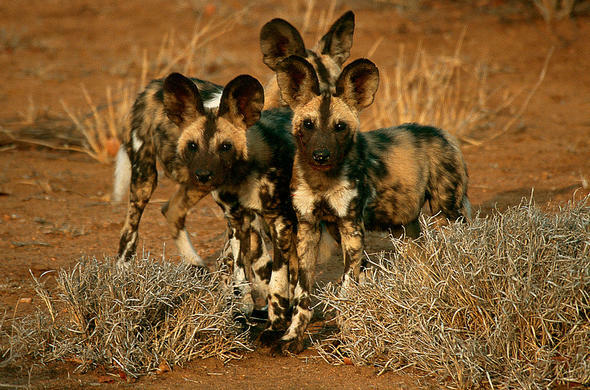 Botswana is home to around 30% of the world's remaining Wild Dog population. They were one found in 39 countries in Africa. Today, they are found in just 4 countries, namely Zimbabwe, Tanzania, Botswana and South Africa. 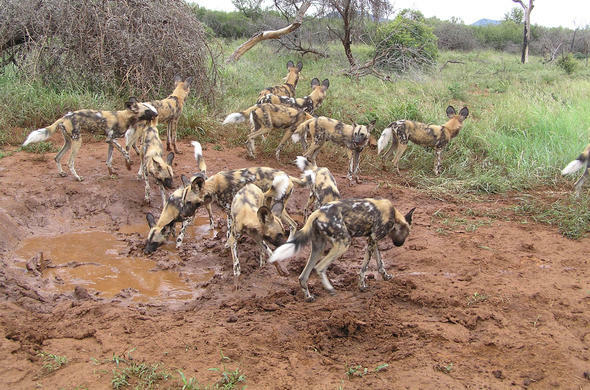 It is estimated that there are between 3000 and 5000 Wild Dogs left in the wild and Zimbabwe is home to the largest population with around 700 Wild Dogs. They got their name because they are very efficient hunters and they were perceived to be a big threat to the local farmer's animals. They hunt in large packs over a vast distance. Using teamwork they just about always have a successful kill. They were considered such a threat that many of them were hunted. This combined with the loss of their vast home ranges has meant that they have been slowly declining in recent decades. 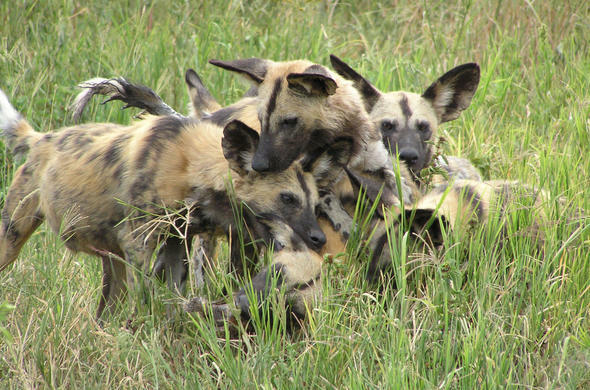 The Wild Dogs are pretty animals with their patchwork quilts of red brown, black and white patches. They are very social animals and live in packs. Only the alpha pair will breed and this also limits their numbers. They have vast home ranges of up to 750km square and travel up to 30km a day. They are very active animals and are always on the move. 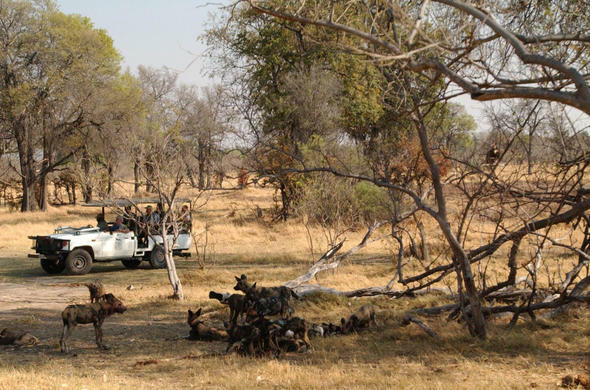 They range all over the north-eastern areas of the northern Okavango in the open plains and sparse woodlands. 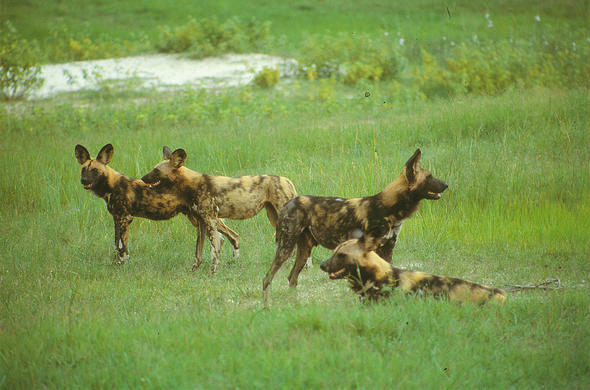 Moremi Game Reserve in the Okavango is considered to be one of the best places in Botswana to see them as it has between 150 and 200 Wild Dogs.